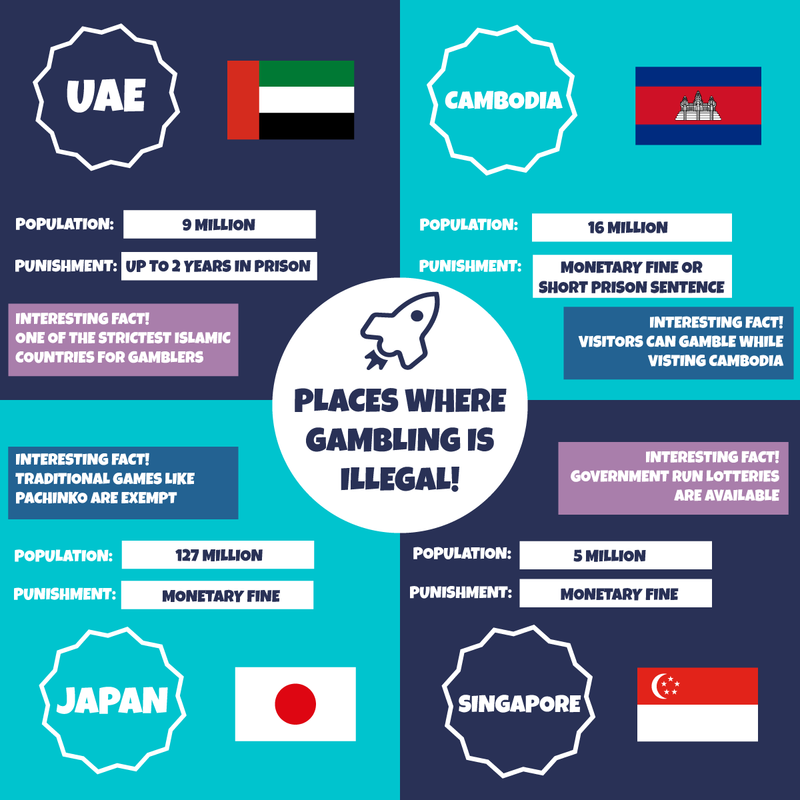 While many Islamic countries have outlawed gambling, the United Arab Emirates punishes this quite severely. Under their penal code, any player caught engaging in online gambling can serve up to 2 years in prison! This is policed in person and also by telecoms providers, who can flag this kind of activity to the authorities. Access to online casinos is generally blocked by service providers, though it is possible for players to subvert these. However, this can be dangerous and more than a few citizens have fallen foul of this law, playing slots and bingo here will cost you! The population of this country has historically struggled with gambling addiction, so the government outlawed the practice in 1996. This country had become crippled with issues around problem gambling, with little in the way of support available to the population. While this practice is outlawed for citizens, visitors to the country can feel free to gamble within its borders. Cambodia has a thriving casino industry, though it’s strictly a tourist endeavour. This sprung up due to the fact that neighbouring countries with a Buddhist population wouldn’t offer gambling services. Therefore, if tourists wanted to gamble in the area they would cross the border and spend their money in Cambodia. There are some forms of gambling that are permitted within this country, but the laws are strict when it comes to online gambling. This is forbidden for Japanese citizens and can warrant a fine from the government. Although gambling is technically illegal, some traditional games like pachinko are allowed. Mobile gambling had cropped up within this country, but after a government crackdown many of these sites have since disappeared. Just this year, a new bill was passed in this country to allow for casinos in the country, but only where they are attached to a tourist resort. In order to discourage their own citizens from visiting too often, they’re only allowed to gamble a total of 10 times per month and must pay an entry fee, where foreigners would be admitted for free. This country has also substantially cracked down on illegal online gambling. In the nation, there are only two land based public casinos, who operate with the express permission from the government. The only option for those that want to gamble online here is to take part in the few government controlled lotteries. Their land based casino options have similar restrictions to those that will eventually be placed on Japanese casinos. This is again to reduce the harm that addiction can do in their country. With gambling addiction on the rise in many countries that offer online gambling, it’s interesting to see that so many choose to outlaw it entirely.